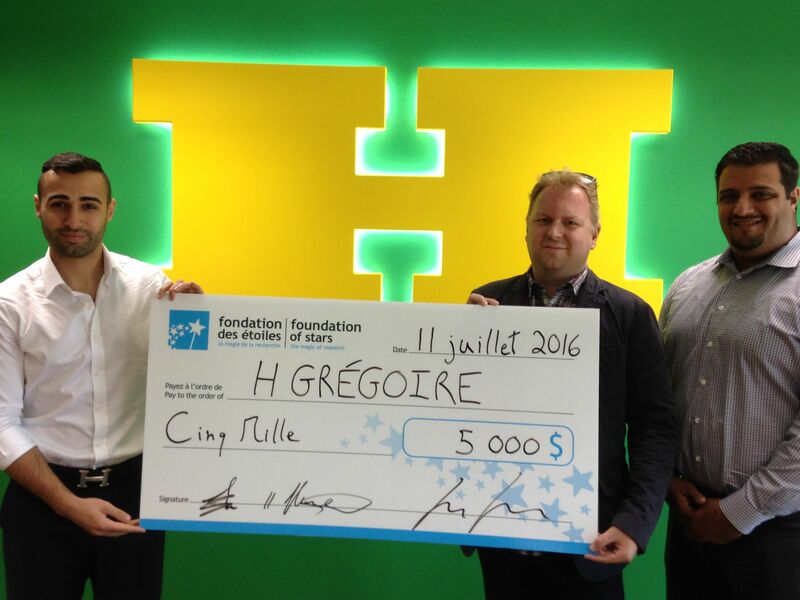 HGregoire is proud to continue to support the sick children cause by sponsoring the Foundation of Stars, with a donation of $5,000. On the picture, from left to right: Harry Kasparian, Communications and Marketing Director, Étienne Lalonde, Development Director at the Foundation of Stars, Fady Bouras, Vice-President of Marketing and Sales. The Foundation of Stars supports research in childhood diseases in order to help our children grow up healthy. It is now recognized as the largest non-governmental source of funding for pediatric research in Quebec. Since its establishment in 1977, the Foundation of Stars has raised close to $70 million and has funded major research projects focused on childhood diseases. The Foundation of Stars has helped improve the lives of children worldwide by supporting researchers who have distinguished themselves through the excellence of their innovative work. This work has led to major advances and huge victories.